Through the medium of photography, Hai Bo dwells on the passage of time and its consequences, namely the decay of beauty and the inevitability of death. While inspired by his personal experiences, the works convey the weight of history. 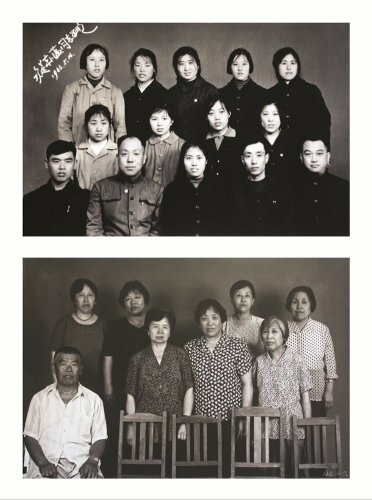 In his earlier works, the They series, the artist juxtaposed photographs, collected from friends and acquaintances dating back to the time of the Cultural Revolution, with photographs of the same people in the same arrangements but taken in a completely different cultural context of today’s China. The people in both images are the same, those who have passed away are marked by a void in comparison to the earlier photograph. In the era of Mao Zedong they were a collective entity, wearing uniforms and similar haircuts, and this monotony and anonymity is reinforced by the black and white photography. 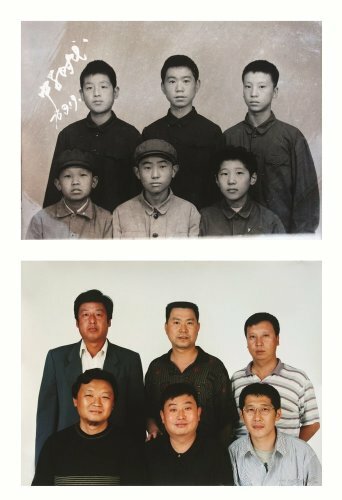 The same protagonists, living in China thirty years later, are now a collection of individuals grouped together and they are distinguished by their different features and clothing, an effect enhanced by colour photography. The romantic portrayal of the glorious youth of the Cultural Revolution has given way to the picture of age. The discrepancy of both representations illustrates the cultural divide between both periods. Throughout his artistic career, Hai Bo has kept exploring the inevitable fate of Man, aging and the vanity of human pursuits.